She came, she saw, she pointed out the audience's various foibles. First off, thanks must be extended to the following: Susan the African-American lady, Edgar the gay guy, Eva the Asian lady, Frank the white guy, and One-Eye, the man with one eye. Had any of them not attended Lisa Lampanelli’s performance and not sat in the front rows, Lampanelli might have focused her wrath on the rest of us. In fact, after Lampanelli prowled the aisles like some kind of Italian lioness looking for prey, this reviewer could not have been happier to see her return to the stage, where the bright lights would spare those of us in back from being torn to pieces like so many hapless gazelles and zebras. Anyone familiar with Lampanelli’s Grammy-nominated stand-up album Dirty Girl or her appearances on Comedy Central’s Friars Club roasts should understand that her better bits won’t be reprinted here, mostly because rendering them in print couldn’t re-create the full impact of her delivery. On paper, it’s old-fashioned bigotry. Coming directly from the gateway to Hell that is Lampanelli’s mouth, however, the jokes generate laughs, even from people who would otherwise be embarrassed or offended. Her act, if the Santa Barbara performance is any indication, consists of her mocking the people who paid to see her and managing not to get decked in the process. But how? 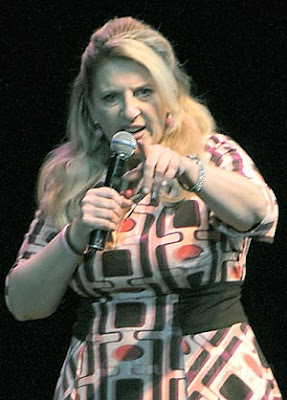 With her mane of pretty blonde hair and her pink dress seemingly contradicting her every filthy comment, Lampanelli resembles a happy homemaker gone bad, and perhaps that fact allows her to get away with using derogatory names for every conceivable type of minority. After all, what other white comedian could have gotten dozens of Hispanic audience members at the Arlington not only to willingly raise their hands in identification of themselves as “spics” but also to laugh while doing it? Those who attended likely knew what they were in for and laughed until they hurt. One hopes that anyone who wouldn’t have enjoyed Lampanelli’s one-woman war on political correctness had the good sense to see Dana Carvey at the Lobero instead.